Low-income and elderly homeowners in Germantown often defer exterior home repairs because of their expense and past experiences with unscrupulous contractors. URDC’s Owner Occupied Home Repair Program helps these homeowners pay for exterior home repairs through low-interest loans, grants, and church volunteer programs. The program develops financial packages customized to the specific needs of the homeowner. 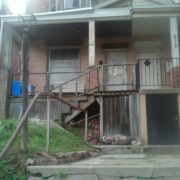 Assisting these families not only improves their homes but prevents further abandonment and deterioration of the surrounding neighborhood. It allows these residents to live in a safe and dignified manner. Over 275 houses have been improved since the inception of the Program. 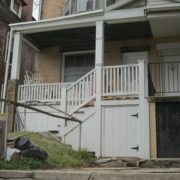 URDC works with its member churches and other neighborhood organizations to identify homeowners in northwest Philadelphia who need help with home repairs. URDC’s Housing Coordinator then contacts the homeowner to assess the work that needs to be done and reviews the homeowner’s finances. A contractor, who has been pre-approved by URDC, then provides an estimate of the work in conjunction with URDC’s Project Manager. Low Interest Loans. Using partner banks, URDC offers low interest, non-collateralized loans to program candidates. URDC screens these candidates and coordinates the loan approval process with the participating bank. URDC Grants. Homeowners may be eligible for grants to assist with some of the home repair expenses. If necessary, the program also works with its congregations for additional financial assistance. Member Churches. URDC coordinates contractors and volunteer work crews from within its congregations to address the housing repair needs of homeowners. Identification of Contractors. URDC’s Owner Occupied Repair Program provides owners with screened contractors and ensures successful project completion. Anyone can refer candidates to the URDC’s Program. To schedule an initial homeowner interview, contact the URDC office at 267-289-2159 or complete the form to the right. When completing the form, please include the name, address, and phone number of the homeowner(s), a brief description of the type of repair needed, and any relevant background information you would like to offer. If you know of someone who needs help, please fill out the information below. A member of our staff will contact you.